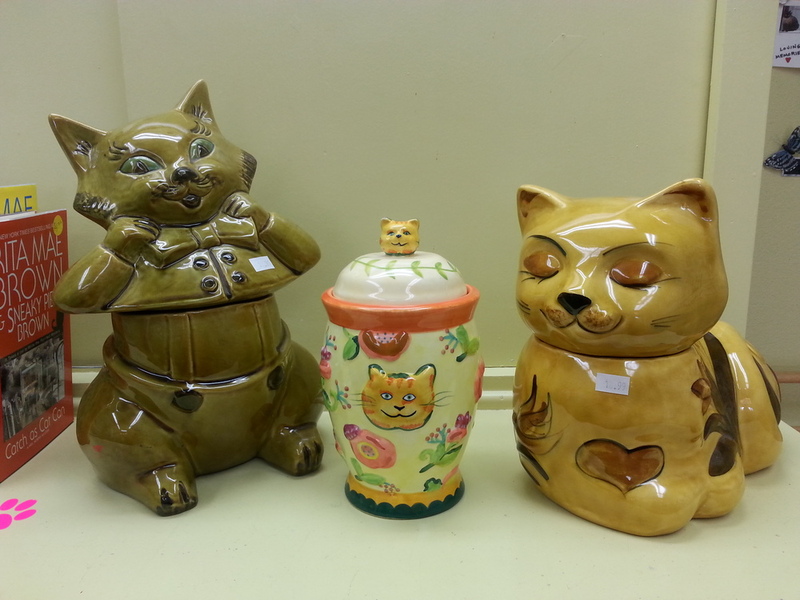 The Cat People Gift Shop has a unique selection of items for cat lovers, including these retro-style cookie jars and treat container. We've stocked the shelves at our Gift Shop with a full selection of Hot Cat catnip toys to keep your kitty playful & active. To help keep your home & yard free of annoying pests, we carry Orange Guard pest control spray. It's safe to use around your furry friends & family. Per your requests, we now have a variety of women's socks with clever cat designs. Shop now for the best selection. We've refreshed our supply of Leanin' Tree greeting cards for birthdays & other occasions, too. We're open 10 a.m. to 3 p.m. Thursday through Saturday at 1930 18th St. in the HP Sears Building in downtown Bakersfield. This poor cat has been passed around to 3 homes now. He is a hypo-allergenic, short haired male, at least 8 years old. It looks like he has some skin issues developing on his face. We have heard that he isn’t great with other cats, but I have not had him in my home so I cannot confirm it. The man who adopted him appeared to be a good guy, but has completely proven otherwise. A few weeks after he adopted him, he posted a picture of the cat on Facebook with a caption, “I F****ing hate this cat.” We immediately reached out to this individual and told him we could help him find a different home. He took a long time to respond, but said it was only a joke (which I don’t believe for one minute). As time progressed, he continued to say mean things about the cat, but every time we asked for a picture to use in re-homing the kitty, the individual refused. He finally sent us this awful picture. I want this cat out ASAP. I feel so bad that he has had to live with this crazy person for so long. This cat is needy, which goes along with his breed. He doesn’t like to be left alone and has a very loud meow. Any forwarding you could do for this cat would be greatly appreciated. Also, if you have any ideas, let me know. There is a desperate need to relocate 7-9 altered semi-feral cats. The property they have been using for shelter has been sold and the new owners do not want cats there. These cats would be excellent mousers but would need a place offering shelter and water. The current caretakers are happy to provide cat food for the duration. Contact barbaraH@thecatpeople.org for more information. Go to smile.amazon.com and they will have you type in your charity. It is under Cat People, Bakersfield, CA. Click that and then you are registered. Just remember to shop on the smile.amazon.com site. We get .5% on every eligible purchase you make on smile.amazon. It's not much, but every little bit helps. Hope you find lots to buy and thank you if you are able to! JANUARY GIFT SHOP SALE: All holiday merchandise and 2014 calendars now 50% off! We're open from 10 a.m. to 3 p.m. Thursdays, Fridays & Saturdays. You can find us at 1930 18th St. just west of the Masonic Temple. Please come out and visit us at the 2013 Kern County Pet Fair, being held at the Kern County Fair Grounds, 1142 South P Street, Bakersfield, CA. We will be there today, Saturday, Nov. 16th, from 10am to 4 pm. Update: A big THANK YOU to all who came out to support us and the other animal groups! We were just notified that someone pulled a very sick kitten out of the Delano shelter on Oct. 22, claiming she was doing this as a request from our organization. She has now set up a personal PayPal account asking for money to pay veterinary expenses for this cat because we will not pay. Please know that we knew nothing about this person/situation and do NOT send money to someone's personal account without properly investigating. I want to thank the concerned animal activist who alerted us to this horrible situation. UPDATE: This situation has been resolved. Please help us find a home for Pansy, a beautiful Persian belonging to a last stage Cancer patient. He is temporarily staying with a foster person but his time is soon up. He is altered, about 10 and just wants to cuddle up on an old chair and know he is safe. If you would be willing to foster or take this old guy in, please contact Barb at : BarbaraH@thecatpeople.org. We are desperate to find foster care for these beautiful, soon-to-be-homeless altered cats whose owner has decided she no long wants them. The Cat People will provide food and litter if you can possibly keep them for about three weeks…..very friendly, loving and ready to be thrown out. Contact barbarah@thecatpeople.org if you can help. UPDATE: Bella & Leo have been adopted. We are desperate to place or do longtime fostering…. Cissy was found left in a box with a note attached stating that her owner died and she had no where to go. She is a highly affectionate, but shy at first, five year old spayed tabby. Cissy needs to be in a one cat, indoor home. Her favorite pastime is just looking out the window or cuddling by you. Please email barbarah@thecatpeople.org if you can provide a home for this sweet girl. If you really care about abandoned cats, AKA community cats, you can make a difference in the lives of these poor cats. Thanks to the new KC program, these cats can be altered, vaccinated and returned at no cost to anyone willing to take a little time to trap them. Maybe you do not have time to participate in full time volunteer work but would be willing to help once a week/month transport or trap, email barbarah@thecatpeople.org and we will talk with you about the many ways you can make life better for these felines. Thanks to the hardworking efforts of very dedicated cat lovers, the Happy Cats Clinic grant met its goal of altering 2600 cats. Unfortunately, the clinics are over until the next round of the grant. At that time 93306 will still be included but the grant will pay for at least one more zip code-to be determined. In the meantime, caretakers can call 868-6999 or email KernTNR.com if a trapped, non- owned, free-roaming cat needs to be altered. While we are sad that the clinics are over, just think that we now have 2600 non-breeding cats out there! We will update our blog and Facebook as we get more information. Monjii, Masaki & Michio, available for adoption July 27th, loving, affectionate and rescued from a horrible situation. Kittens available. 8 weeks old. Visit our Gift Shop this summer and get a free Cat People tote bag when you buy at least $20 in merchandise. It's our way of thanking you for supporting us. So, come into our Gift Shop and see what's new. We're always adding items with the cat lover in mind. We're open from 10 a.m. to 3 p.m. Thursday through Saturday. You can find us at 1930 18th St. in the H.P. Sears building, just west of the Masonic Temple. Make sure you check out our Facebook page for more updates! Learn how you can help cats by visiting our donate page.